Having just finished my formal and grown-up review of this restaurant for The Lawyer magazine, I felt it only right and proper that I do one of my own personal reviews, because (and this will not surprise anyone ) I have more to say. I liked it as soon as I walked in. The maitre d’ had a lovely floral shirt and a sense of humour (the two may be linked) and put me at my ease immediately. I’m a restaurant reviewer novice and not used to the whole business of it, so that whilst acknowledging the fact that I was there on a quasi-official basis, nothing more was made of it for the rest of the evening. Which was nice. I was a bit floored when the great Bruno himself delivered the main course and wondered whether he wanted to just take a quick look at this latest addition to the reviewing scene. As if. 10 minutes later he did the same to the next table. Whilst I could pretend that it was to get yet another look at me, even in my wildest dreams I know that is narcissistic, nay, paranoid and that this personal service is clearly just something he does. Which is great, if a little disconcerting. 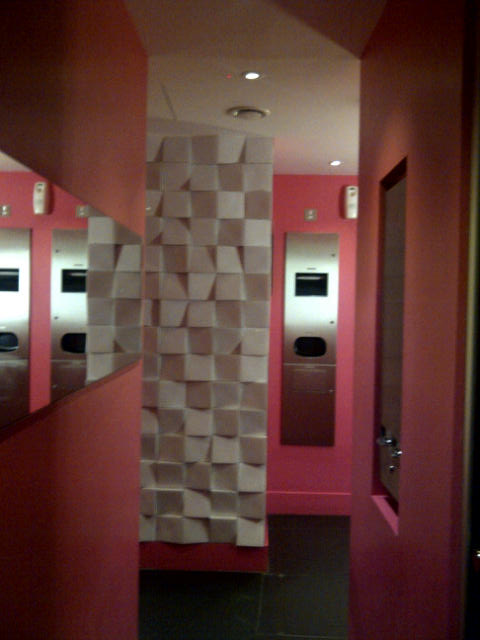 I know I should talk about the food first, but I was particularly impressed by the pink toilets. They were bright and bold and most importantly, clean. I like the style of this place, it was very Clerkenwell, but not in an off-putting way, not in Hoxton/Shoreditch way, where I am just that little bit too old and that little bit too frumpy and indeed that little bit too straight to enjoy myself properly. I know that says more about me than it does about the restaurant, but hey. I started with what is known as a Bruno Infusion.” After the day in the office that I’d just had, I think that blood transfusion would have been more in order, but it was good and interesting, if a tad too sweet for me as an aperitif . 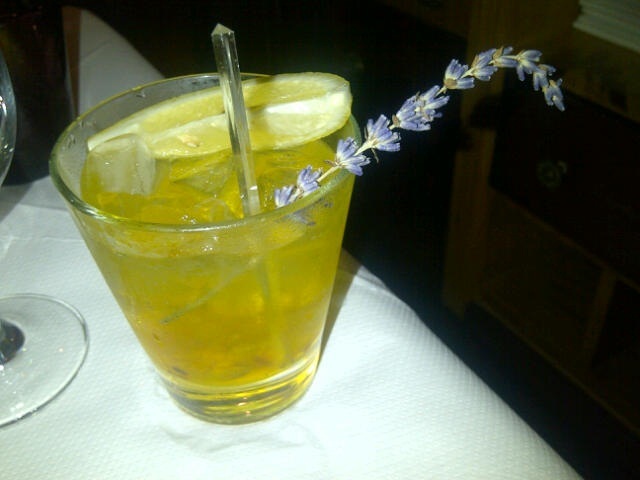 I remember lemon, orange lavender rosemary and vermouth. And syrup. It would have been excellent with, or indeed after, dessert but I prefer something a little drier. I then moved onto my starter. I’d obviously misheard because I thought I was going to get raw vegetables with a dip of some sort – you know some sort of crudites – type dish with a warm dip. Bagna caude, I believe is what I heard. I’m sure that the words raw and vegetables did feature. What I got was a very delicious stew of broad beans and artichoke – a barigoule, no less. You would’ve thought then, that the kitchen might have stopped me from ordering the summer fish cassoulet which had, effectively, pretty much the same stew as its base. I know I ordered it and indeed, asked them to convert it from a main course to a starter, but somebody on the ball would have picked that up and told me not to do it. Indeed, the fantastically helpful waitress did say, when I mentioned it, that she wasn’t expecting that dish and was very apologetic . Had I not been reviewing formally, I would have asked for a replacement for the main course, because it was (and I very rarely say this) simply too much food. It was all entirely delicious though, the flavouring being incredibly intense and surefooted. The chef comes from south-west France and, like his mentor, Pierre Koffman, cooks robust rustic food, using some lesser-known parts of the animal and the not so expensive types of fish and the cooking is none the worse for that . The wine list is excellent and varied, majoring in the south west region, to match the cooking. You can go for cheap-but-interesting (the wines start at £15.95) or plump for one of the big boys at the top of the wine list. The menu doesn’t look particularly challenging, which is not meant as a criticism, although there are a couple of dishes which were borderline – mackerel tartare with salted watermelon for one. In fact, the simplicity of the description belies the complexity of the food and there’s something for everyone – the adventurous and the conservative although I suspect that the decor would put off the more conservative diner. It’s a bit industrial/trendy/eclectic and I liked it, but then I’ve got fairly catholic taste both in design and food. I must confess that I didn’t really like the dessert. Had I not been reviewing, I wouldn’t have bothered with dessert at all, because I really wasn’t hungry by that stage and having undone my trousers, it was a sign that I was really quite full. Even I can read that sign. As a concession to dignity and believe me, we were hanging by a thread at that point, I went for fruit. Strawberries, actually, with peppercorn ice cream and lemon marshmallow. I know that strawberries and pepper are meant to work, but they don’t really work for me and I really didn’t like the peppercorn ice cream. Too much of a kick and whilst it sort of worked with the strawberries it wasn’t particularly great as a combination and I left most of it, without any regret. Unusual, for me. I should have had the chocolate delice with salted caramel. What was I thinking? Having said all that, I really did like this. I think the cooking is assured uncompromising and confident and I love the fact that the chef is actually there in the kitchen, doing the cooking indeed literally putting the food on your table. Quite frankly, they already had me at the off, given that the first thing on the menu was watercress soup with comfort dish #1, boiled eggs and soldiers. I’ll definitely be going back but I’ll be a little bit more careful about what I order and next time, I may even listen. Which would be a first, I’m told.